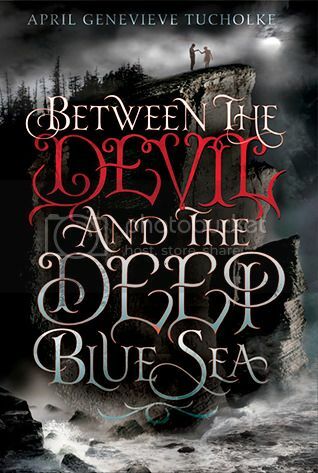 Trying to put my thoughts about Between the Devil and the Deep Blue Sea isn’t going to be easy. I even stepped away for a week, to allow me time to process my thoughts, and still, they’re not quite clear. However, I shall certainly do my best. When I headed into this tale, it did not, at first, read like a book of paranormal-ness, but more like one of sadness that’s shrouding a couple of abandoned children and obliterates the misconception that the rich kids have it better. From the off, the almost lyrical tone of the voice is evident, adding a haunting quality to the overall tone, as well as seeming to warn of bad things to come. And it soon becomes clear that the paranormal elements of this story are just as strong in this tale as in any other, but their uniqueness and the way in which they are presented draws the reader into its subtle intensity with ease. Also, this tale possibly borders on horror, because although the characters don’t appear to be in any immediate danger—or not Violet, at least—the presentiment is apparent enough for us to be concerned. And I loved Violet. Eccentricity in a teenage body. Yet, she still managed to sound authentic to her age. She was a great character, and even as she falls prey to River’s charms, and as the behaviour she expresses should have us angering over her stupidity and naivety, she is somehow far too captivating to dislike. Even River shouldn’t be likeable. He’s obviously slightly deranged, definitely damaged, and has little control. However, I kind of loved him, too, as if such is his power that he wooed me, also. There were, as expected less likeable characters. Like Summer, whose selfishness and disregard is a definite ugly trait. The guy nobody even realises is there, and who sneaks up on the storyline with great stealth and misdirection. And Violet’s brother, who at first appears to treat her poorly—an appearance fed by Violet’s own view of him—takes a while to earn respect from the author; which he does, once his true and deeply buried feelings are allowed room to breathe. Not to mention the young stray they end up connected to, as intriguing as he is mysterious; and River’s brother, who I swayed toward like a flower does to the sun. I guess, too, the reader should be annoyed—or at least irked—by the lack of parental presence, even though it’s somewhat explained, but I was just too overwhelmed by Violet’s embedded sadness because it all to allow that irritation to fester. Overall, this is a great addition to this ever-expanding genre. Hauntingly beautiful, creepily eerie, and dark twists and turns that will keep the reader guessing. Now I’m just hoping for a follow-up, because I love reassurance that characters I’ve come to love will be okay. In short, you all want to check this one out, for sure.